David (Kentucker Audley) is something of a mumbly lost soul; he's a twenty-something musician wannabe who unhappily works in a Memphis sporting goods store run by his mother's boyfriend. David rents a house with his neck-bearded pal Eric (Timothy Morton), who describes himself as "that tall guy with a really cool personality", who when the day is done is just as lost and clueless as David. Female relationships and personal direction prove problematic for both, and over the span of 62 minutes the sometimes mundane reality of their lives in Team Picture unspools like some kind of meandering spycam peek into their existence. David wants to quit his job to be "in his own world for awhile" while pining for Sarah, the elusive girl next door (Amanda Harris), while Eric develops apparent twinges of domestic bliss with Hilary (Chellie Bowman). Audley is the alter ego of Andrew Nenninger, and with Team Picture the writer/director/actor has crafted one of those starkly minimalist indie features, the kind where not much really happens, yet the spontaneous texture of the conversations and actions between characters just drips with a very real feel. When David's artist girlfriend leaves him, she demands to know why he never asked her what was upsetting her, and his cluelessly blank-face/shrugged shoulder response says more than three paragraphs of carefully written clever dialogue ever could, while Eric's constant attempts at sparking some level of excitement or comedy�even when delivered in his low-key and deadpan manner�reeks of the same kind of familiar and harmless cluelessness. It is David and Eric's inability to recognize the signs, or to communicate feelings anywhere approaching effectively, that ultimately trip them up at every turn. A friend-driving-a-friend road trip to Chicago for David and Sarah�one that is essentially plutonic�carries a beautiful undercurrent of lopsided sexual chemistry. While Audley's David dances slowly around the social perimeter of their friendship, Amanda Harris plays Sarah with a spot-on distance that is oh so hard to read. Is she interested or not? It's a terrific bit of smart and subtle acting from Harris, one that will probably be painfully identifiable to anyone who has gone through a similar stab at getting close to someone who may or may not be interested. And yes, I'm referring to a personal experience I went through myself, thankfully from my long ago college days. And yes, Harris' nails that casual interest/disinterest thing with eerie perfection. The world that Kentucker Audley showcases here is one filled with Pabst Tall Boys, baby pools in the front yard, open mic nights and the sort of drift-with-the-current lifestyle that seems a lifetime away from where I'm at currently. But like a lot of us, I was there once many moons ago�maybe the same, maybe a bit different�but the need to strike out and make bad decisions (or execute good ones poorly) is part of the whole life-making process. Team Picture may never arrive at any grandiose conclusions, but I felt like I was looking at people I knew very well at one time. Some, perhaps, more so than others. Image Transfer Review: Audley's film is presented in its original 1.33:1 aspect ratio. It's a clean transfer, though image quality varies a bit across the board dependent on where a scene was shot. Colors appear bright throughout (especially the greens), and fleshtones look natural. Some of the darker interiors or shadowy exteriors reveal a marked loss of edge definition, but given the indie nature of Team Picture it is all part of the package. Audio Transfer Review: Audio is provided in 2.0 stereo, and it's generally a clean track, delivering voices usually clear without much fanfare. Sort of like real life. It's a fairly flat mix, yet one that matches the minimalist presentation. A bit of crackle is heard midway through, and this may have been a result of Audley shooting outdoors, and not necessarily related to the audio transfer itself. Extras Review: Team Picture is packaged in a white plastic keepcase inside of slipcover, and in something of a rarity, the artwork is different. 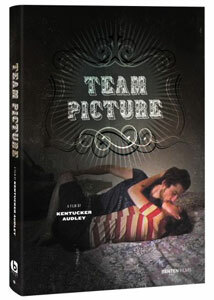 The slipcover front features Kentucker Audley and Amanda Harris in an embrace on a bed, while the case itself sports a somewhat more stylized shot of Audley with his guitar. Inside is a 4-page booklet with an article by Filmmaker Magazine's Nick Dawson entitled Room For More Than One Enjoyer, which looks at Andrew Nenninger, who is the real-life counterpart of the Kentucker Audley persona. Audley and co-star Timothy Morton deliver a disappointing mumblecore commentary track that is a challenge to sit through, and perhaps I was just expecting more insight from them. It's a commentary where apparently none was needed, at least based on the content. The highpoint here is Ginger Sand: A New Epilogue To Team Picture (08m:53s), a satisfyingly uncomfortable peek into the near future of characters David and Eric. Like the main film, not much really happens, but it's still lazy and awkwardly fun to watch unfold. Other extras include And He Just Comes Around And Dances With You (15m:10s), a black-and-white short film from Audley about yet another anonymous lost soul with girl issues, who comes across as a variation of Timothy Morton's Eric. The soliloquy/dialogue portions drip with the same kind of layered, natural flow as Team Picture, and while it is oddly paced, I found myself pleasantly dragged along. Music Performances By Kentucker Audley and Timothy Morton (16m:00s) feature a few tunes performed live in a coffee shop, with Audley on guitar/harmonica/vocals and Morton stepping in on banjo. A block of five deleted scenes are also included, with the longest running just over three minutes. It's difficult to isolate any of these scenes as essential viewing, but they all feel as if they could have easily been part of the final edit in some weird way. The disc is cut into 15 chapters, and does not feature any subtitle options. Here's a film where it looks and sounds like a hidden camera was around to capture the lives of a couple of slackery types as they live (sort of), love (not all that much) and do nothing (plenty of that). The absence of any real apparent direction or purpose may anger those looking for a definite beginning, middle and end, yet it's the journey and conversations that makes this one so rich.